A NEW initiative developed by the National Farmers’ Federation (NFF) and Grain Producers South Australia (GPSA) aims to assist farmers better understand and comply with heavy vehicle regulations. “Chain of Responsibility… Made Easy!” is designed to eliminate the confusion and frustration farmers often feel when complying with Chain of Responsibility (CoR) legislation. As part of the project, the NFF and GPSA have developed a range of online resources, all aimed at better informing farmers of their heavy vehicle compliance obligations. 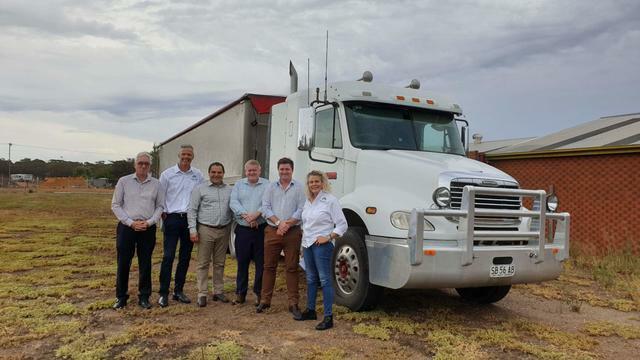 “The information covers a diverse range of CoR-related scenarios such as farmers driving their own trucks or contracting a carrier to transport their produce or livestock,” NFF president Fiona Simson said. The online resources are hosted by the NFF on the Australian Farmers website. “The resources include compliance checklists and factsheets that explain what farmers need to do to comply with the Chain of Responsibility legislation,” Ms Simson said. The online information is complementary to free workshops, facilitated by GPSA and Natwide, currently underway in regional towns across South Australia. Primary Producers South Australia executive chair Robert Kerin said the workshops were an invaluable opportunity for farmers. “Heavy vehicle safety is everyone’s business and farmers take the role they play in safe transport of goods and livestock seriously. The workshops are funded by the NHVR’s National Heavy Vehicle Safety Initiative, supported by the Commonwealth Government. Good Morning, I am a transport operator in rural NSW and also a Board Member of Trucksafe- the transport industry’s own heavy vehicle compliance scheme. Owned and operated by the Australian Trucking Association. We are about to launch our new Standards which will make all members of Trucksafe compliant with the new COR laws. This would be a easy fit for farmers who operate trucks and want to comply with the new NHVR Laws. Please contact me on 0358816668 if you would like more information.